Colourful fantasy worlds full of speech bubbles and motion lines. Buildings with human characteristics, and invisible architecture. Since the early years of the 20th century, architects have shown an enduring interest in the comic strip as a means to explore their field of activity. What is it about comics that architects find so liberating and interesting? 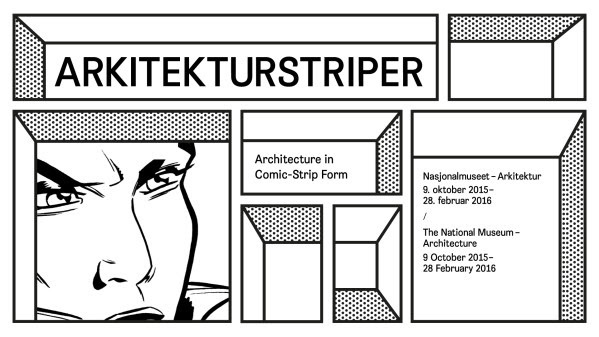 “Architecture in Comic-Strip Form”, the new autumn exhibition at the National Museum – Architecture, examines the relationship between the medium of the comic strip and architecture to reveal an aspect of the architectural discipline that few people are aware of. Many architects use the comic strip as a form of expression – as a kind of counterpart or supplement to digital drawing. “The combination of text and image makes it possible to express a complex message in a way that’s easy to grasp and in a style that has broad appeal to a wide audience. We hope this exhibition will help expand people’s perceptions of what architecture can be,” say curators Mélanie van der Hoorn and Anne Marit Lunde. “Architecture in Comic-Strip Form” presents the comic strip as more than just an unconventional form of expression for visualising ideas. It also reveals the contribution comic strips can make as a form of architectural critique, as a design tool in the development of architectural projects, and as a means of communicating with the public. The exhibition is organised under seven thematic headings that clarify how and why architects use this medium: Inspiration, Subjective Reportage, Imagination, Concept, Critique, Design Tool and Presentation. The works in the exhibition cover the period from 1911 to the present: works such as Winsor McCay’sLittle Nemo in Slumberland (1911), Le Corbusier’s Lettre à Madame Meyer (1925), Archigram’s Space Probe (1964), and Chris Ware’s Building Stories (2012) are all important and inspiring examples of how architects use the comic strip format. Other works by, for example, Jean Nouvel, OMA, Moon Hoon, Alexandre Doucin, Håkon Matre Aasarød, Fréderic Bézian, Wes Jones and Jimenez Lai illustrate the sheer range of styles in architectural comic strips – from small, hand-drawn items to large-format, digitally produced works. The exhibition presents some eighty works. Most are comic strips created or commissioned by architects, or which resulted from collaborations between architects and cartoonists. Many of the works are originals, loaned in by the National Museum specifically for the exhibition, which collectively reflect a broad geographical and temporal range. The exhibition also features other media, such as models, installations, books and animated films. The characteristic boxes and sequential divisions of the comic strip provide an all-encompassing setting for the works on display. The exhibition is curated by Anne Marit Lunde, from the National Museum, and Mélanie van der Hoorn, an independent researcher and curator. The exhibition architecture is by Håkon Matre Aasarød. Two publications will be available in conjunction with the exhibition: Bricks & Balloons: Architecture in Comic Strip Form (Mélanie van Der Hoorn, 010 Publishers, 2012), and the exhibition catalogue, which includes texts by the curators Mélanie van der Hoorn and Anne Marit Lunde. The following are represented in the exhibition: Le Corbusier, Håkon Matre Aasarød, Archigram, Atelier Feichang Jianzhu, Diane Berg, Pierre-Alain Bertola, Frédéric Bézian, BIG, Roberta Gorni, C+S Associati, Eduardo Cecchin, Alberto Cipriani / Mauro Marchesi, De Urbanisten, Richard J. Dietrich, Alexandre Doucin, Drawing Architecture Studio, Elastico Spa, Esben Titland & Eriksen Skajaa Arkitekter, Martin Étienne, Yona Friedman, Ghilardi + Hellsten Arkitekter, Matthias Gnehm, John Halas & Joy Batchelor, Kaare Hanssen-Holbæk, Wes Jones, Ness Lafoy, Jimenez Lai, Sara Muzio, Make Architects, Winsor McCay, Moon Hoon, Ateliers Jean Nouvel, OMA, Quiet Time, Frode Rinnan, François Schuiten + Benoît Peeters, Aristofanis Soulikias, Studio Asynchrome, Studio TAM Associati, Uniform, Zhan Wang, Chris Ware.